Everyday in parks have a lot of people walk or exercise, we note that, before the park bench is made of steel or iron, after a few years, they will rot, in order to change this situation,wood plastic bench instead of previous bench, widely used in the park or the city bus station because the park benches are in outdoors, then the wood plastic composite bench is widely application, are often exposed to the elements, what advantages of wood plastic bench? 1,waterproof, moisture-proof. 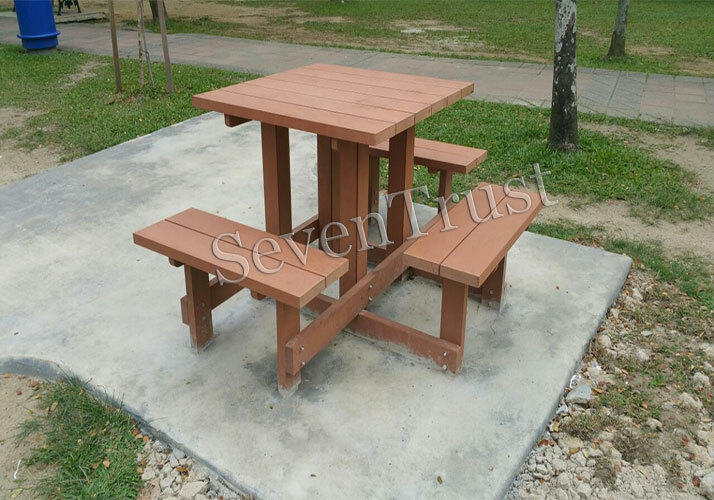 Outdoor wood plastic bench fundamental solution of wood products absorbing moisture easily rot, swelling deformation problem. 2, outdoor wood plastic bench durable, wearproof, pest control, effective way to eliminate insects harassment and prolong life. 3, wood plastic bench colorful, many colors can be choose . Both natural wood texture and wood grain, and can customize according to their individual needs color. 4, wood plastic bench plasticity, can provide private customer tailor. 5, wood plastic bench high fire resistance. Effective flame retardant, fire rating to B1 level, fire self-extinguishing, does not produce any toxic gases. 6, high environmental protection, pollution-free, pollution-free, can be 100% recycled, environmental friendly, saving forest resource. 7, workability, and can be set, planing, sawing, drilling, surface can be painted. 8, More flexible, easy to install and clean. does not require complicated construction process, saving installation time and costs. 9. No painting or staining. 10, outdoor wood plastic bench not inflated, no distortion, easy maintenance and clean, saving repair and maintenance costs.